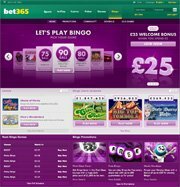 The Bet365 Group has been around for over a decade, but just recently launched its latest online gaming sector, Bet365 Bingo, in 2008. Employing Virtue Fusion software, Bet365 Bingo is licensed and regulated by the UK Gambling Commission, known for maintaining the strictest requirements in security and overall quality. Bet365 Bingo is visually appealing, using the same basic theme as it's other online gaming operations (Bet365 Casino, Bet365 Poker, Bet365 Sports, etc), except with an aesthetic lavender overtone charm that appeals especially to women. Bet365 Bingo offers both 75-Ball bingo and 90-Ball Bingo, as well as the latest variant craze, 90-Ball Spanish Bingo. Bet365 Bingo is packed with action at all hours of the day, being one of the leading online Bingo sites all across Europe. There are 8 Bingo Rooms to choose from, with games varying between 75-Ball Bingo, 90-Ball Bingo and the new 90-Ball Spanish Bingo. Standard ticket prices range anywhere from £0.02 to £0.25, though 1p ticket games can be found in special rooms at certain hours of the day (see Bet365 Bingo Bonus & Promotions). The CM's at Bet365 Bingo host regular Bingo Chat Games throughout the rooms each day. There's a massive variety of games played, depending on your current room and CM, each awarding BP (bonus points). The Virtue SFusion software that powers Bet365 Bingo specializes in online bingo gaming, ensuring a solid, stable Bingo environment. The graphics are exquisite, combining the standard appearance of all Bet365 gaming portals with cool lavender undertones. All Bingo activities, from registration, to game play to cashier processes, is performed directly in your browser via Flash technologies, with no download required to play. This translates to global OS compatibility and a much quicker start time on your first visit. Bet365 Bingo employs one of the most professional customer support teams in all the online gambling industry. Via Live Chat, Email, Toll-Free Phone, Fax or a convenient Call-Back method, support is available 24/7, providing fast, reliable answers to all of your questions. Currencies: ARS, AUD, BGN, BRL, CAD, CHF, CZK, DKK, EUR, GBP, HKD, HUF, INR, ISK, JPY, MYR, MXN, NZD, NOK, PLN, RMB, RON, SEK, SGD, THB, TWD, USD and ZAR. Deposits: Visa, MasterCard, Maestro, Laser, Visa Electron, EntroPay, NETeller, Moneybookers, PaySafeCard, Click2Pay, Ukash, Fast Bank Transfer, Bank Wire and Cheque. Withdrawals: Visa, MasterCard, Maestro, Laser, Visa Electron, NETeller, Moneybookers, Click2Pay, Fast Bank Transfer, Bank Wire and Cheque. If you want to read another unbiased Bet365 Bingo review, please follow the link to my friend's site.